Treaties and alliances govern relations among states and have exerted tremendous influence on historical events throughout the ages. However, it can be hard to find concise, accurate summaries of the terms and consequences of specific treaties. 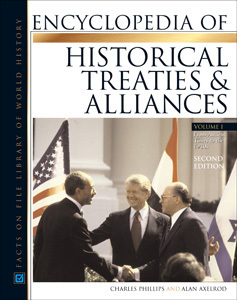 Encyclopedia of Historical Treaties and Alliances, Second Edition solves this problem, bringing extensive excerpts from the treaties of more than 420 international agreements in an elegantly accessible format. Divided into chronological chapters ranging from ancient Mesopotamia to the present, each chapter begins with a summary of the important trends and events in international relations of the era. Entries on specific agreements follow, with each containing the date of the document's signing, a list of signatory nations, the leading negotiators, and key terms. A narrative discussion outlines the historical context, identifies the essential positions of the signatories, and summarizes the document's significance. In addition to treaties that concluded wars, the book includes treaties on the environment, armaments, trade, human rights, scientific exploration, and many other concerns. This edition of Encyclopedia of Historical Treaties and Alliances includes 20 new multilateral treaties and conventions, taking into account the transition in the orientation of U.S. foreign policy that was ushered in with the administration of George W. Bush. A new chapter called "International Threats, Global Opportunities" begins with a thematic and historical overview followed by nine new treaties. In addition, sources for all treaty documents have been added, making it easy to cite information. Accessible to all audiences, this up-to-date encyclopedia gives students, researchers, and teachers a clear idea of the changing political conditions throughout history. Protocol to the Convention on Torture. "A useful source for anyone interested in or studying international affairs; recommended for school and academic libraries." "...very useful for general public use." "Academic libraries will most likely want to update their holdings with this new edition..."